These tubs have a small footprint, but a deep soak. A project for a long weekend. Follow these steps to install a 3-piece tub and shower surround. Follow these steps to install a clawfoot tub shower curtain rod. 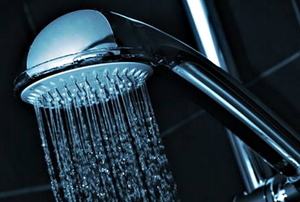 Follow these steps to repair a bathtub leak. Follow these steps to repair holes in a fiberglass tub. Read this article for advice on eliminating water behind a bathtub liner. 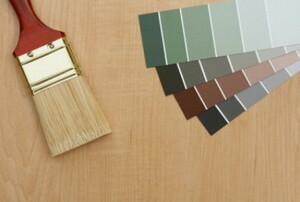 Read this advice on painting a tub. Follow these steps to remove a cast iron bathtub. 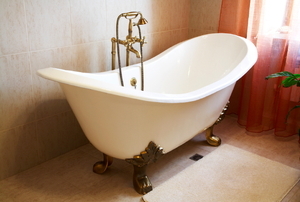 Read this article for advice on repairing a damaged fiberglass tub. Follow these steps to replace a clawfoot tub drain. Follow these steps to remove a fiberglass tub surround. Read Part 1 of our series on installing sliding glass bathtub doors. Follow these steps to clean a fiberglass tub surrounds. Installing sliding bathtub doors do not only help keep your privacy while you take a shower, it also helps keep the water from splashing out to other areas in your bathroom, which is supposed to be dry. 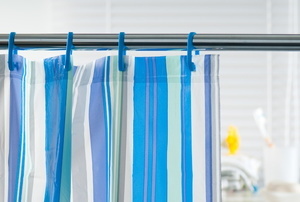 Sure, you can use a curtain in place but it only accumulates mildew and is hard to clean and maintain. Read this important advice on installing a fiberglass tub surround. 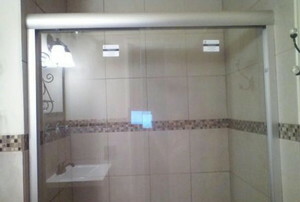 Read this article for advice on choosing a shower curtain for your clawfoot tub. Follow these steps to replace clawfoot tub feet. Read this important advice on plumbing a clawfoot tub. Follow these steps to frame a fiberglass tub. Follow these steps to install a bathtub liner. Read Part 1 of our series on replacing a corner bathtub. Follow these steps to refurbish a clawfoot bathtub. 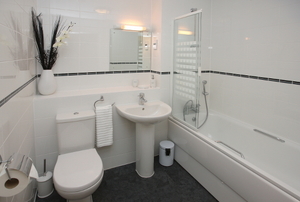 Read this important advice on installing a freestanding bathtub. Follow these steps to prepare your own bathtub reglazing kit. Follow these steps to remove a clawfoot tub. Follow these steps to refinish a fiberglass bathtub. Read these pros and cons of having a window in your bathtub surround. Read these helpful tips on clawfoot tub enclosures. It can be tough to choose a faucet for your clawfoot bathtub. Read this article for information on the most common options to help you decide. Just because your fiberglass tub has become scratched and cracked, you don't have to break the bank on a new unit. 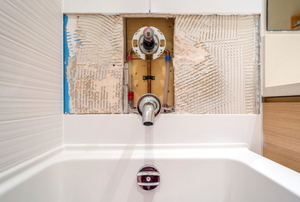 Just follow these steps to repair the damage and seal the tub. 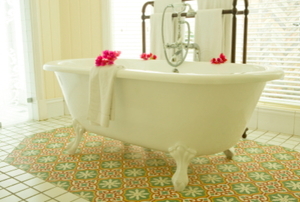 Read this advice on designing the space for your clawfoot bathtub. Tub wall panels are not as difficult to install as people assume. Follow these steps to complete the project correctly. 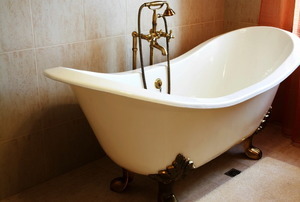 Read this advice on reglazing a worn out cast iron bathtub. 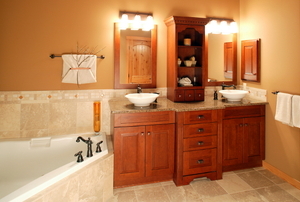 Read this article for advice on planning the cost of refinishing your bathtub. 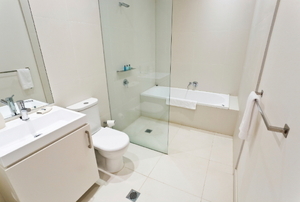 Read Part 3 of our series on sliding bathtub door. Read this article to understand why doors are better than a shower curtain. 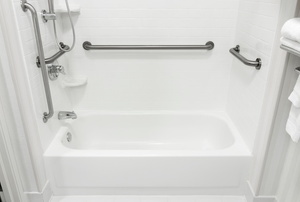 Read this article for information on the most common enclosures for clawfoot tubs. Most people prefer acrylic bathtub liners. Read this article to find out why. Air jet tubs are great. Here's why. Will a Bathtub Liner Get Damaged if Water Leaks Behind It? Read this advice on the damage that can be caused by water behind the bathtub liner. Read this article for advice on reglazing a clawfoot bathtub. Read this quick safety advice on acid washing a bathtub. 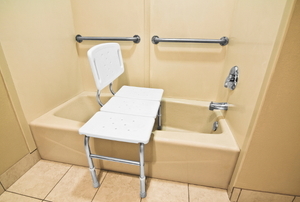 Learn the top 5 advantages of bathtub liners for your bathroom project. 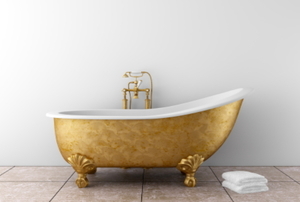 Read this article for advice on designing a bathroom with a vintage tub.